Joel Schneider on guitar/vocals, Andy Lum behind the drum kit – first started playing together in 2012. Both hailing from Seattle, they'd known about each other for years, but it took crossing paths in Texas for the two to finally connect. Their latest release titled, Shiver + Shake is an album that truly marks a rebirth of the band. It's a reboot, a restart, a resurrection – the sound of two kindred spirits that finally found each other and those pieces starting to fall into place. The album's thirteen songs are as powerful as they are vulnerable, delivering a full on blast of defiance while wrestling with demons and insecurities. Recorded live in the studio and produced by Rick Parashar (Pearl Jam, Alice In Chains, Blind Melon), there are elements of blues and garage rock coursing through the veins of this album. Formed in 2006, Inter Arma is one of the most talked about heavy bands to come out of Richmond, VA. Inter Arma follow up their universally acclaimed Sky Burial with the epic 40+ minute one-song The Cavern EP. Recorded during breaks from the relentless touring the band did on the Sky Burial album with the likes of Baroness, Russian Circles and more, this new EP is the ultimate exhibition of the genius that Inter Arma have always hinted at. Unparalleled musicianship meets the soulfully deranged vocals of Mike Paparo to create one of the most impressive pieces of metal to be released this year. Shifting from Americana-laced Black Metal to doom to stoner rock to prog all within a single song, Inter Arma's The Cavern is an opus that will surely be heralded for years to come along the likes of Sleep's Dopesmoker as a work of true artistic vision and endurance. With a sound that evokes the dreamlike natural wonders of their homeland, duo the Holydrug Couple are a part of the burgeoning psychedelic rock scene rising out of Chile. Based in Santiago, members Ives Sepúlveda and Manuel Parra have cultivated a drifting, bluesy sound that weaves a gentle, repetitive tapestry of guitar, drums, and vocals around the listener, softly enveloping them in layers of melody. The Holydrug Couple have done a lot of growing since their first release with Sacred Bones Records in 2011. Their music is like a slow motion 60's beach party dream that you never want to wake from. It is easy to see how listeners will become entranced by this new, dream-like world that The Holydrug Couple have created. When the beloved Minneapolis band Nice Purse tragically ceased to be, a smoking hole was left where the bombastic group once stood tall. Fortunately for the humans of the universe, lead man France Camp decided to continue writing and releasing his own brand of surf punk under his assumed name - along with James Wolfeatens, Dylan Rose and Kyle Kimm - to equally awesome returns. Throughout their blistering eight track debut album, France Camp play smash-n-grab to their rock n roll forefathers, blending and stitching sounds ranging from blues to surf to country twang to brazen punk. Recorded dutifully by Ali Jaafar at Ecstattic Studios in Minneapolis, the band was able to capture the torching, ramshackle energy promised from their often chaotic live performances. 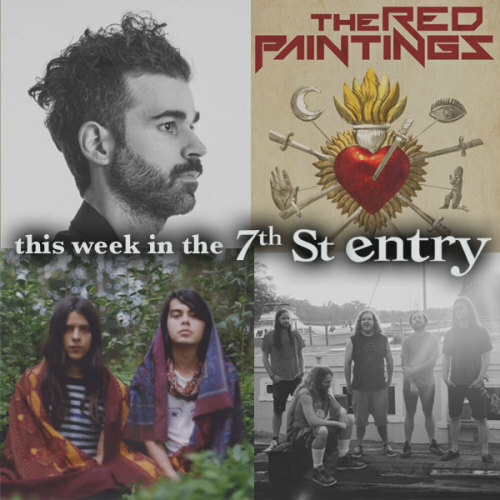 Orchestral art rockers The Red Paintings are in the midst of an ambitious world tour in support of the release of their debut album, The Revolution Is Never Coming. After suffering a near-fatal seizure, visionary performer Trash McSweeney now sees colour in music and has set out to share with the world the ideas he has seen and felt. By taking to his guitar, piano and notebook, The Red Paintings were officially born upon the dawn of the new millennium. Based in London and Los Angeles – and having been fortunate enough to already tour much of the globe – The Red Paintings are a five-piece group (guitar, violin, cello, bass and drums) whose sound evokes everything from child-like lullabies of the future, to tearing, biting, alternative-rock numbers.